Is human flesh furniture a cut above the rest? Every industry has its innovators pushing boundaries past limits the rest of us didn’t know existed – think of the Wright Brothers pioneering flight or Marie Curie’s research into radi­oac­tivity. Whilst posing a significantly reduced risk of personal injury, UK designer Gigi Barker has created furniture that could be considered quite a considerable culture shock. 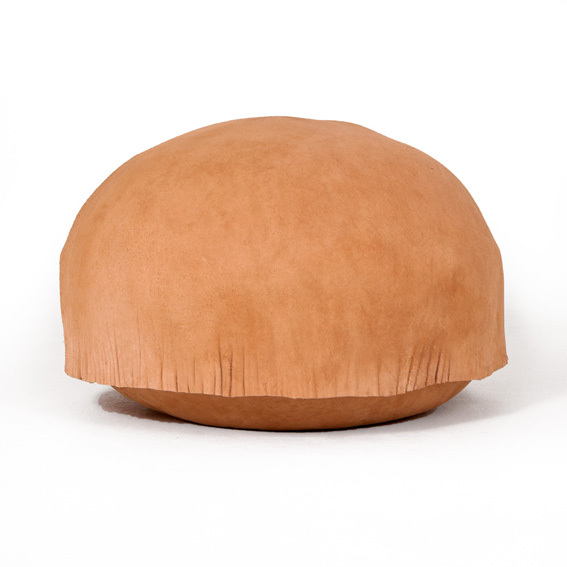 As Wired (link: http://­www.­wired.­co.­uk/­news/­archive/­2014-07­/25/skin-furniture) eloquently puts it, ‘This furniture looks like blobs of human flesh’ and they’re not wrong – there’s a skin chair that resembles a smaller blob resting on a much larger one and a skin stool with a removable leather cover that could have been modeled from any number of body parts. Barker wanted to create a “fully sensorial experience, which really immersed the viewer”, you know, just in case you had ever wondered what it would feel like to recline and relax on a bulbous mass of human flesh. To this end patchy leather is stretched and shaped over a silicone mold to resemble realistic, uneven skin tones and the fleshy tissue under the surface. The furniture has even been infused with human pheromones and aftershave to mimic that authentic new skin smell! That being said, there’s just something about these furniture pieces that begs interaction; they seem appealing in a very unsettling way. Yes, the skin chair looks like the hairless chest and stomach of a rather portly gentleman but there’s still something worryingly attractive about it! This speaks volumes for the success of Bakers’ work. "I have my own personal relationship with it which is based on my own personal history. Just as someone else will. I think this project is more about the people and the bodies rather than the skin itself. That being said as a project it's interesting how reactionary it is given it's essentially silicone and leather shapes, which shouldn't inherently be. This speaks a lot therefore to the emotional associations attached to the work." After successfully pushing the boundaries of furniture design, Baker is now in talks with retailers and is looking to develop the line further through exploring and experimenting with different body shapes and materials. So if you’re considering diving in to the world of skin furnishings but don’t want to confront the socially awkward situation of essentially sitting on a naked man then there’s some hope yet. However, if you’re more of a traditional furniture connoisseur then why not take a look at our range of Chesterfield Furniture instead?